We can’t wait to see you at NAB (April 8-11, Las Vegas, NV) in less than a week! Our special guest artists are putting last minute touches on their Sapphire, Continuum & Mocha Pro demos. Swing by the booth to learn some new tips & tricks on how to use your favorite plug-ins! And make sure to get your badge scanned to automatically be entered into our daily giveaways with over $75K of prizes! Artists include Ben Brownlee, Digital Media Specialist, Curious Turtle Pro Video; Alejandro Brubaker, Co-Founder, Sugar Skull Creative; Ben Eshagpoor, Creative Director, BeMotion Design; Nick Harauz, Apple, Adobe, and Avid certified instructor, co-founder of Creative 111; Damien LeVeck, Writer/Director and Owner of Skubalon Creative; and the Boris FX team including Mary Poplin, product specialist; Vin Morreale, product specialist; and more. 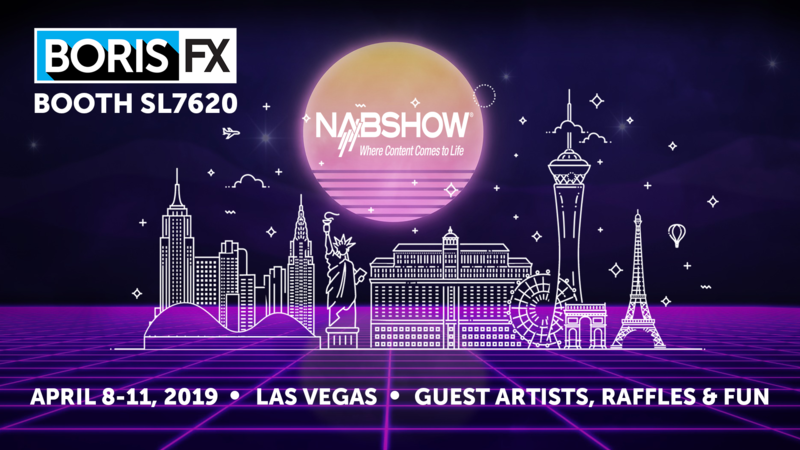 VFX in After Effects: An Artists Panel – Tuesday, April 9 at 5pm, Adobe Booth SL5610 – Mary Poplin will be joining Andrew, founder, Video Copilot; and Jayse Hansen, VFX artist. Avid Connect – April 6-7th – Boris FX team will be demoing at Dell’s pod in the exhibitor zone on Saturday & Sunday. ARIA Resort & Casino. 3730 S Las Vegas Blvd.